Hunter the mascot poses with UOIT Student Union (from left) Amr Elzeiny, USU VP of student affairs, Jessica Nguyen president, Fahad Khalid, VP of student services and UOIT president Steven Murphy on the ice rink outside the library. Bubble soccer, a Guinness world record-breaking attempt and a chance to win $10,000 doesn’t sound like a normal Ridgebacks’ home game, but this week is different for UOIT men’s hockey. 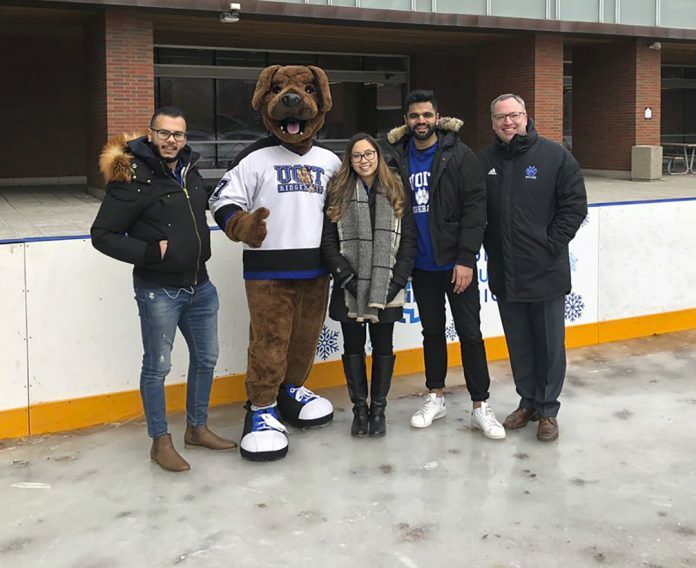 The team will play the Nipissing Lakers Friday at 7:30 p.m. as the main event of Frost Fest’s Hockey Night, organized by the UOIT Student Union. “We have such a strong athletics program here and by working with the Student Union we wanted to create more pride and reputation on campus,” says UOIT Student Union President Jessica Nguyen. The event is the winter version of UOIT’s Uchella which takes place in September. It is meant to help new students meet new people and get everyone involved in the school community at the beginning of the semester. “We did a lot of programming that targets different student groups on different campuses and just giving people different experiences that will make their overall student life a lot better,” says Nguyen. One of the events of Hockey Night will be UOIT trying to break the world record for the most high-fives given by a mascot in one minute. According to Scott Dennis, manager of intercollegiate athletics, the current record is 194 high-fives and there are strict rules on how the challenge must be completed. “We started doing the logistics of it and because we’re dealing with stairwells over there (at the Campus Ice Centre) it might be tough to do,” says Dennis. The Friday night game is a regular league contest, but the world record-setting attempt might end up being a practice run, says Dennis. He says they might have to set the record at a soccer game due to issues with space in the arena. Although size and space may cause challenges for the for the record attempt, the size and capacity of the Campus Ice Centre is ideal for the home team. Chris Cameron, sports information and special events coordinator for the Ridgebacks and the Lords, says the atmosphere in the arena is always great. According to the Ontario University Athletics website, the Ridgebacks are ninth in game attendance, averaging 220 people per game. “We’re not expecting to sell out every night…but having a special night like this is another reason to identify another reason to come to the game which is a great idea,” says Cameron. This season, the Ridgebacks are fifth in the East Division standings with eleven wins, six regulation losses and four overtime/shootout losses. Oddly, they have lost seven of their ten games at home and are 8-3 on the road. Nipissing is in eighth place in the east with a 6-13-0 record. The night will hold events such as bubble soccer on the ice, a shootout to win $10,000 and the Guinness challenge during intermissions. Students will also have the opportunity to get their picture taken with Ridgebacks’ mascot, Hunter, with a chance to win a photo contest. “I just hope to see students out there and rocking their blue,” Nguyen says.